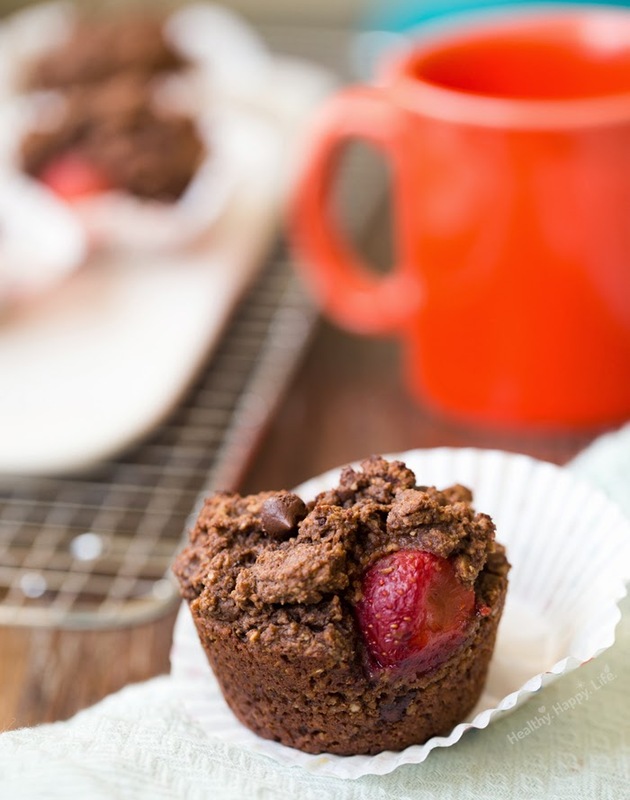 These Double Chocolate-Covered Strawberry-Banana Protein Muffins are the perfect blend of treat meets healthy snack. 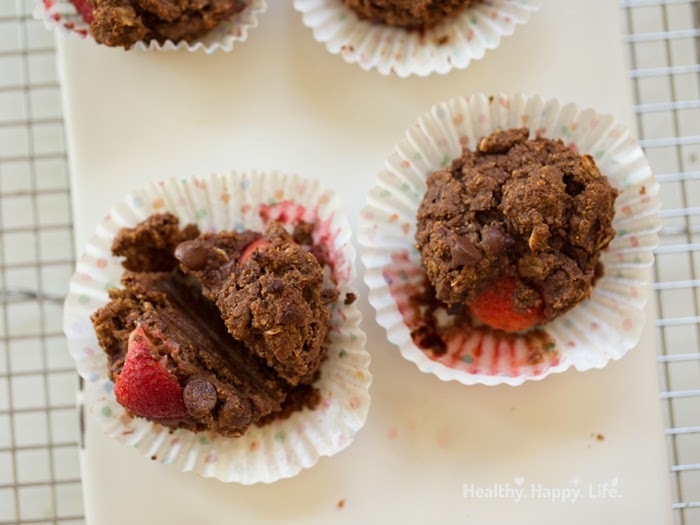 Each fluffy, rich chocolate bite is loaded with whole grain oats, bananas, a hint of berry, cinnamon, rich virgin coconut oil and an extra dose of chocolate. Plus, I've added some vegan brown rice based protein powder and a scoop of optional maca powder too. 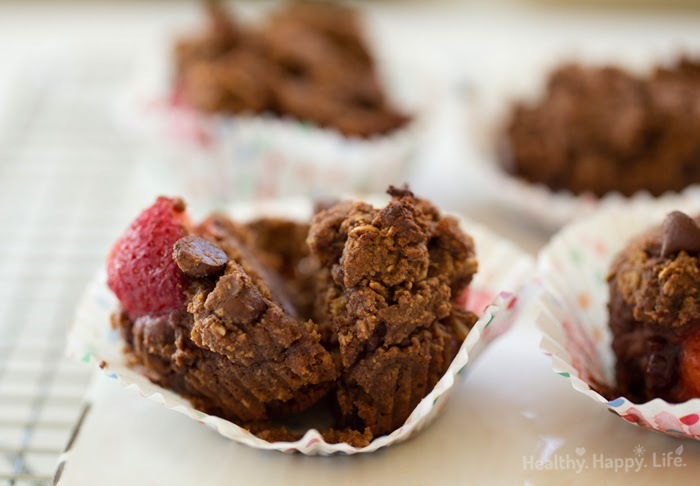 Bake these babies and get your chocolate fix!.. Eat now or later. 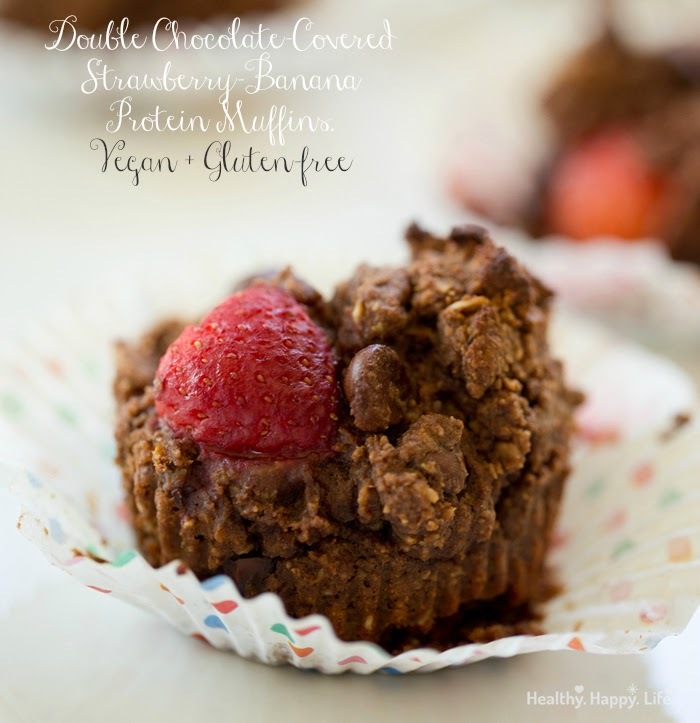 These vegan muffins are delicious served warm or chilled. They have a melt-in-you-mouth texture when warmed and a rustic textured, crumbly yet velvet-y bite when chilled. The gluten-free oat flour makes them moist and tender. 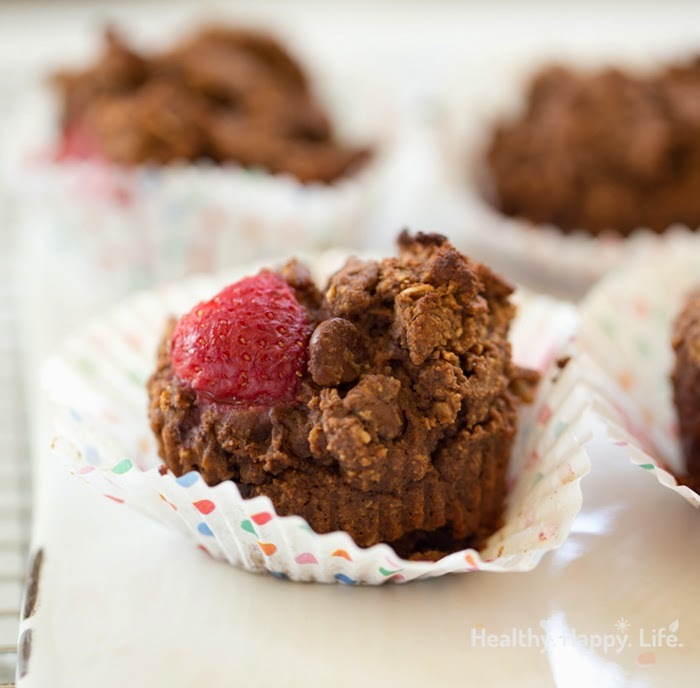 They are sweetened with the sweet bananas and a bit of coconut sugar. Make it a Dessert! 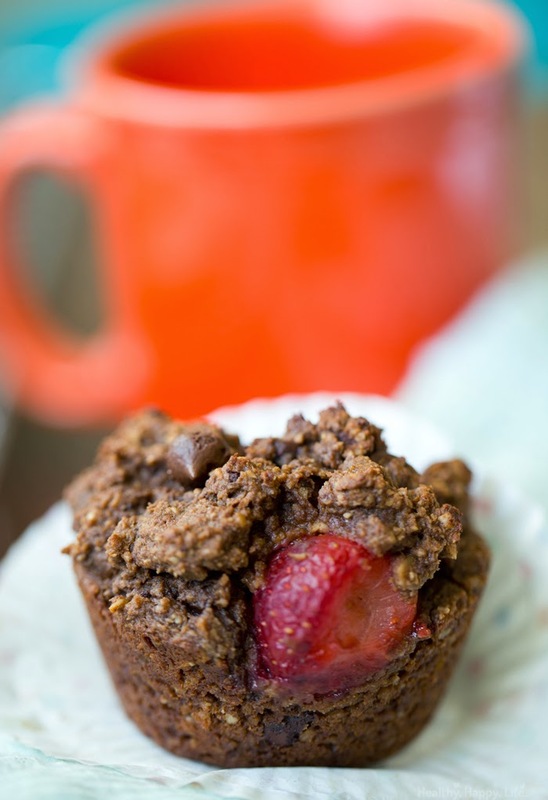 Make this a sweeter treat by adding a scoop of coconut milk ice cream on the side of a warm muffin with some vegan chocolate sauce. 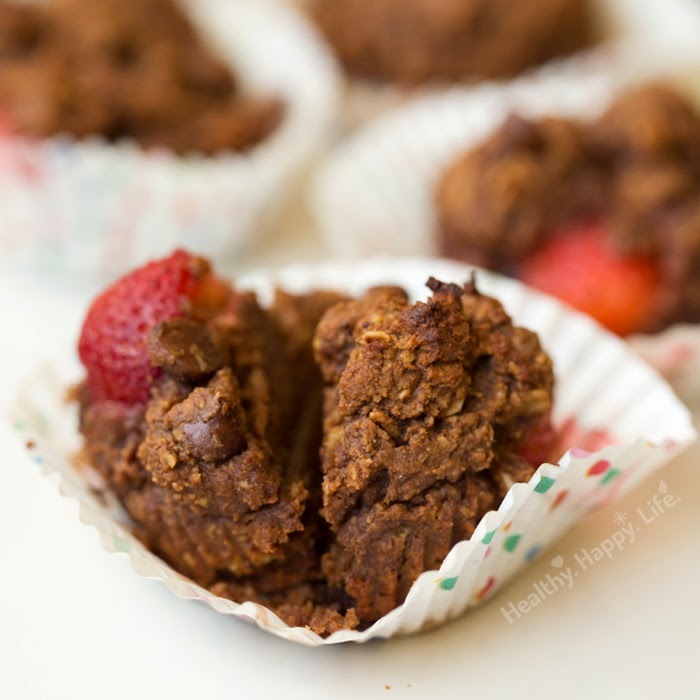 Vegan and gluten free double chocolate muffins rich in fiber, cocoa goodness and a hint of added protein. Preheat oven to 400 degrees and grease a muffin tin with a generous amount of virgin coconut oil or use muffin liners. Place whole oats in a blender or food processor and blend until an oat flour forms. 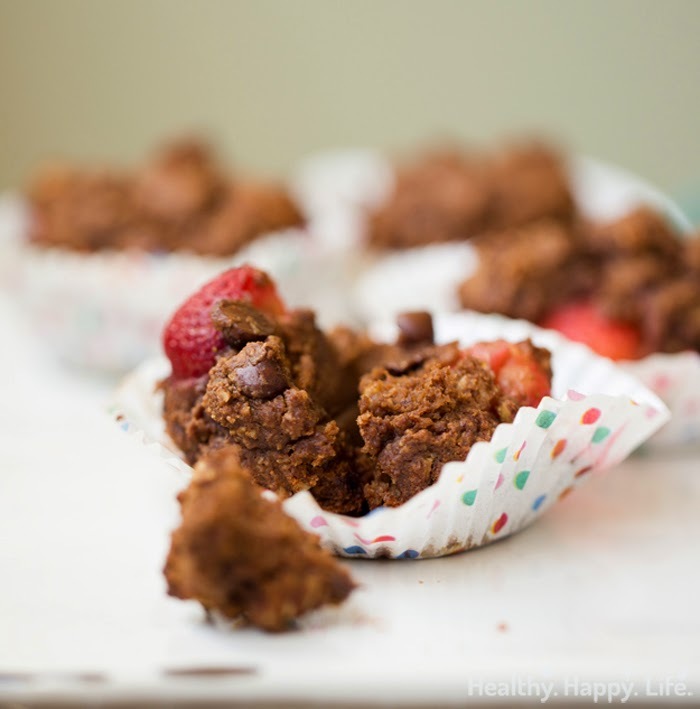 Add the oat flour, cacao, salt, baking powder, sugar, cinnamon, protein powder and optional maca powder in a large mixing bowl. Stir until combined. Add bananas, coconut oil and vinegar to blender and blend until smooth. With blender on low, slowly pour in non-dairy milk. Pour the banana mixture into the chocolate dry mixture and stir until combined. Batter should be thick and clump, but still soft. Fold in the chocolate chips and the frozen berries. The chilled berries will firm up the batter a lot. This will allow the muffins to bake up in clumpy textured mounds. Bake muffins at 400 degrees for ten minutes, then lower oven to 375 degrees and bake for another 12-15 minutes, or until the edges crisp up a bit, but do not burn. Serve warm or place in the fridge to chill up. Delicious served chilled (firmer texture) or warm and soft. Prep Time: 00 hrs. 13 mins. Cook time: 00 hrs. 22 mins.